First stop is the gas station with coffee shop next door. We sit in the sun and have a coffee before driving 35 miles back on HWY 24 to visit the upper part of Capitol Reef National Park. The official scenic road ends after about 10 miles but a small and very rough dirt road continues. We venture into it (the first hurdle is a river bed) and continue for about 3 miles. As the road doesn’t improve and the landscape doesn’t change much we turn around instead of going another 12 miles to HWY 12 (this would have taken us the rest of the day). This official part of the park is very nice as well with steep, dark red and golden cliffs rocks and hills, but if you have seen the lower part and driven Burr Trail Road you have seen it. Out of the park we turn east again and back to Hanksville. The landscape is very similar to Smoky Mountain Road, beautiful scenery. In Hanksville we stop again to get gas, coffee and and ice cream cone (meanwhile it’s lunch time). We then head south where we came from last night, but we don’t take the turn to Bullfrog Marina, but instead continue on HWY 95. 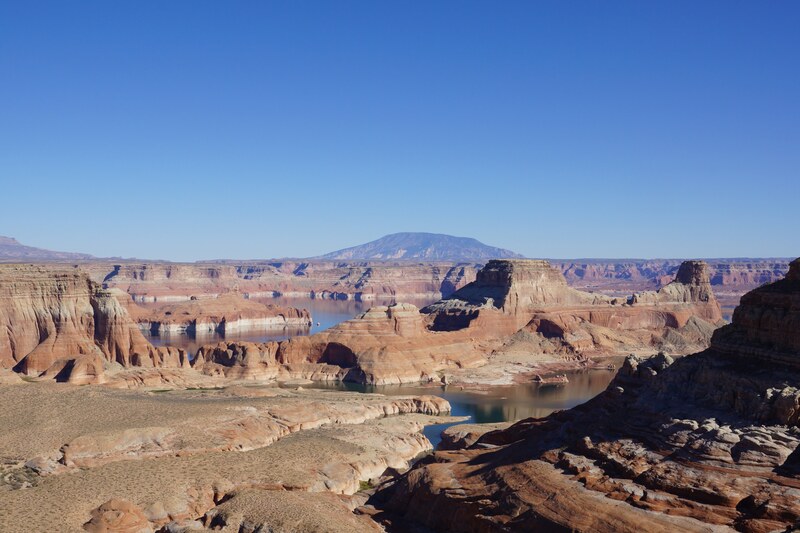 We reach Glen Canyon National Recreation Area which surrounds the whole of Lake Powell. Here we are at the upper end of the lake where the Colorado and the San Juan River enter the lake. The water is brownish and not deep blue as it is further down towards Page. But never the less the area is breathtaking we stop again and again to glimpse down at the lake/river and up at the mountains and take pictures. From here you can see all the way to Monument Valley, which is about 70 miles away “as the crow flies”. Towards late afternoon we finally reach Natural Bridges National Monument with its three natural bridges. The park preserves some of the finest examples of natural stone architecture in the southwest. On a tree-covered mesa next to deep sandstone canyons, three natural bridges formed when meandering streams slowly cut through the canyon walls. In honor of the Native Americans that made this area their home, the bridges are named “Kachina,” “Owachomo” and “Sipapu.” They were known only to the Native Americans until 1883. The park offers a loop of 9 miles length with walks to view points from which the bridges can be seen. Also, for each one of the bridges there are trails leading down to them. The first two we only watch from the view point, but the third one we wanna see from close and walk down (it’s the shortest walk of all of them). Between the first and the second bridge we walk out to the view point from which we can see some Anasazi ruins which were built sometime between 1050 and 1300 AD. They still don’t really know much about these early tribes. Only assumptions about the purpose of these dwellings are available. In Blanding we first give our Jeep a well deserved wash (Marco does). Then we look for accommodation as it meanwhile is just after 7:00 pm.